Countrylink XPT on the Full Bucket line at Thomas Canyon. 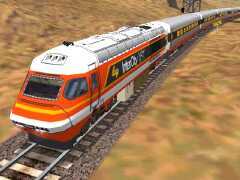 This year, 2002, is the 20th anniversary of the introduction of the XPT trainsets in Australia. Railway Digest March 2002 and April 2002 editions tell the story in more detail. As well, a visit to David Bromage's site at www.railpage.org.au/xpt/ is highly informative. Some readers may know that the XPT was derived from the British High Speed Train (Class 43 HST) and it celebrates its 25th birthday in 2002. For Australian conditions, the Paxman Valenta engine was detuned, different bogies were fitted and new passenger cars designed and constructed. Virgin Trains Intercity 125 Class 43 HST loco VirginIC125.zip (734kb, 11-Dec-01), updated Virgin Class 43 Virgin43.zip (843kb, 14-Apr-02) and carriages VirginIntercityFirst.zip (148kb, 11-Dec-01) from UK Trainsim. To see how to alias, i.e., re-use the HST Class 43 cabview and sounds for each Class 43 and/or XPT trainsets, see Class 43 HST / XPT Cab & Sounds Aliasing. We're now going to make some changes so that we have consistency between folder names, ENGine file names, and .S and .SD file names to avoid MSTS being upset at any stage. This technique is recommended for any rolling stock installation, although not all developers follow it. See the ENG file section of ENG, CVF & SMS files for more information and browse the sample ENG file to see where this naming is implemented. So what we're going to do is to use three folders: xpt for one power car, xpthep for a power car supplying head-end-power for lighting and heating/cooling in the passenger coaches, and xptecon for the economy class passenger car. Highlight the Trainset folder name because we now want to create two new folders. Firstly, make a new folder named xpthep. Make sure you've got Trainset highlighted and make another folder named xptecon. Highlight xpt and select all the files here, except those with xptecon in their name, and copy them to xpthep. Again working in the xpt folder, select all the files except the ENG file, and move them to xptecon. Still in the xpt folder, delete xptecon.wag or rename it to something like xptecon-orig-wag.bkp. Now highlight the xpthep folder and name the ENG, .S and .SD files to xpthep.eng, xpthep.sd and xpthep.s. The tricky part is to remember to make corresponding file name changes in xpthep.eng and xpthep.sd to point to the renamed xpthep.s. Do a save but leave xpthep.eng open because there are the engine variables to change. You may as well open another copy of WordPad and load xpt.eng too. As a final check (because webTrainSim can't remember! ), open xptecon.sd in WordPad to make sure there's a reference to xptecon.s. As well, load xptecon.wag to make sure it's WagonShape line points to xptecon.s. On reading David Bromage's XPT specs page, webTrainSim noted that he listed the traction horsepower available to a power car as well as the reduction in horsepower for the power car supplying head-on-power to the passenger cars. That's the reason for splitting up the original installation folder - after changing some engine values, we'll have two more realistically powered power cars. You'll see that the sound and cabview aliases are listed in the above edits - we'll tell you below where they came from. dynamic brake parameters (if applicable). James Hunt is responsbile for developing a BR-liveried Intercity 125 HST with a custom cabview. So you can alias his cabview to the XPT. You'll need brcl43.zip (4.5Mb, 24-Jan-02) from the Train-Sim.com file library. If you're searching the Train-sim.com file library, search for brcl43*.zip in case the filename is incorrect. Follow James' instructions in his readme to make his cabview available. Don't forget the closing quote marks! The default XPT ENGine file, xpt.eng uses the sounds of the default Dash 9 - for those who have heard an XPT, the Dash 9 sounds are completely inadequate! Bear in mind, too, that the XPT engines now have 4 low pressure turbochargers and 2 high pressure turbochargers - all those spinning rotors make lots of whine noise! So for some real sounds, you'll need cl43sfx.zip (4.2Mb, 14-Feb-02) from the Train-Sim.com file library. A final step is to use ConBuilder to edit the couple of consists that you loaded into the Consists folder as part of the original installation of the XPT. The two consists are named aunsw4xpt and aunsw6xpt. Delete all the rolling stock in each of these and build them again (to your own taste if you like), remembering that you need at least one XPT power car with HEP in each consist for prototypical performance. When webTrainSim did a quick run on the Full Bucket Line with the re-tuned XPT set (the 6-car consist), performance seemed prototypical and top speed was a touch under 160kmh. MaxPower above is the rated figure for the BR Class 43 Intercity 125 power cars. The values for MaxForce and MaxContinuousForce were taken from a page comparing most of today's High Speed Trains. This site specifies the Class 43s to have 1320kw of power at the rail. You might notice that the Paxman engine revs a lot higher than other diesels, especially at idle (webTrainSim has heard a couple standing at Spencer Street). The ARHS Railway Digest of April 2002 gives a good description of the XPT roster and how hard they work each week. On roster one, the Dubbo set travels just on 6,500 km/week. Roster two is for the Melbourne, Brisbane, Murwillumbah and Grafton services to/from Sydney. This is a complicated roster of seven separate trainsets, each covering just over 10,000 km/week. For those more interested in the specs of the Paxman VP185 diesel motor, see the links on David Bromage's XPT specs page or use these links: Valenta diesel engine specs and Valenta Paxman VP185 specs to read/download the Alstrom docs (PDF format).